Last month, my blog was selected by Feedspot as one of the Top 100 Transgender Blogs on the web. When I checked the Top 100 list, I discovered that Femulate was in the number 20 slot! Earlier today, Feedspot informed me that Femulate is also one of the Top 50 Trans Woman Blogs on the web. Specifically, they rank Femulate number 4 on their list! Daniel Bilić femulates on Crotian television's Your Face Sounds Familiar. 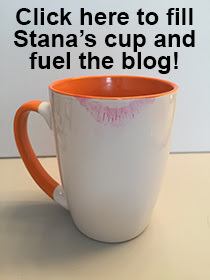 Congratulations, Stana! You deserve it, after all, Femulate is the centre of the blog universe! WOW and WOW. So happy for you. Lady, you're something else. Oh, and thanks again for a truly (and demonstrably) great blog.